The swift passage and signing of the landmark tax bill drove the economy to the No. 1 spot in the news agenda last week. 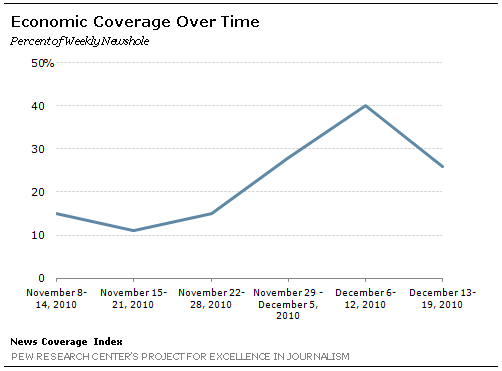 From December 12-19, the economy accounted for 26% of the newshole studied in the weekly news index of the Pew Research Center’s Project for Excellence in Journalism. That is somewhat less than the 40% focused on the economy the week before, but is consistent with recent weeks of intense media attention to the subject. More than any other issue, the tax bill drove last week’s economic coverage, accounting for about two-thirds of it. A mix of other items, including the omnibus spending bill, the debate over earmarks, and news about holiday retail sales, were factors, too. While the economy overshadowed all other stories, the No. 2 news event, according to PEJ’s weekly News Coverage Index, was a Virginia federal judge’s challenge to the U.S. health care law. For the first time in many months, the debate about health care policy reappeared, accounting for 5% of the newshole. At No. 3 was the death of Richard Holbrooke, a senior U.S. diplomat who had played a key role in working with leaders in both Afghanistan and Pakistan. Holbrooke’s sudden death from heart problems, and the review of his life as a leading diplomat for Democratic Administrations since the 1960s, filled another 5% of the newshole. Also at 5% was the U.S. conflict in Afghanistan, spurred in part by a White House report which indicated that troop withdrawals could begin in mid-2011, on schedule. Finally, at No. 5, was the Wikileaks saga, now in its third week among the top five news stories. This week, journalists reported on the details of the charges and bail hearing for the group’s leader, Julian Assange, who was brought up on charges of sexual misconduct. Much of the coverage also depicted the outcome as a potential harbinger of the political deal-making that might now mark the future of the Obama Presidency. The compromise between the Obama White House and the newly empowered Republican leadership in the House and Senate to extend the Bush era tax cuts across all income groups, including the wealthiest, led all media sectors but one, with newspapers devoting 26% and online news, 20%. Cable news and radio, both home to numerous political talk shows, paid even more attention, at 38% and 35% each. Only in network TV, which focused more on extreme winter weather, was the economy preempted. It filled 12% of that sector’s newshole. Before last week, the bill itself—which extends the tax breaks for two years—was the subject of intense debate and high emotions on Capitol Hill. But last week, as the Senate then the House passed the bill, and by Friday’s presidential signing, a sense of the inevitable seemed to set in among angry Democrats. Many analysts noted the absence of Democratic House leaders at the bill signing ceremony, as well as Senate minority leader Mitch McConnell’s presence. And some vocal Democratic legislators continued to bemoan the bill. The Democratic strategist and CNN political contributor James Carville, on the December 17 airing of Parker Spitzer, echoed Weiner’s sentiment. But even Carville admitted that Obama had to consider the political realities of the moment. And some conservatives, as in weeks before, spoke in favorable terms about the president, suggesting that he may have emerged the winner after the weeks of arguing, politicking and voting on the tax bill. Conservative columnist Charles Krauthammer in the Washington Post on December 17 called Obama the “new comeback kid….Obama had a bad November. Self-confessedly shellacked in the midterm election, he fled the scene to Asia and various unsuccessful meetings, only to return to a sad-sack lame-duck Congress with ghostly dozens of defeated Democrats wandering the halls,” said Krauthammer. U.S. healthcare legislation appeared for the first time in months as a top story when a federal judge in Virginia challenged the provision that all Americans are required to obtain health insurance under the Interstate Commerce clause. The last time health care reform achieved that much coverage was the week of March 29-April 4, 2010, the aftermath of the passage of the bill. That week, the subject accounted for 9% of the news, and was the No. 2 story. Though he never became Secretary of State or reached a cabinet rank, Richard Holbrooke’s sudden death was a major news event. His obituary appeared atop the Washington Post on December 14, as well as the New York Times, which described Holbrooke’s “distinguished career” and his outsized personality. As the U.S. special representative to Afghanistan and Pakistan, Holbrooke’s death—caused by a tear to his aorta—came during a week when that conflict appeared among the top stories in the media, at No. 4. Much of the Afghanistan coverage stemmed from a long-awaited White House report on the troop situation there, which was released on December 16. Also among the top stories was the Wikileaks trove of classified documents that were made available by the group’s leader, Julian Assange. Coverage last week focused on the proceedings related to Assange’s charges in Sweden. Though he remained central to the tax cut drama, Obama’s appearance as a lead newsmaker in stories last week dropped markedly from the week before. This past week he led in 6% of stories studied, down from 14% the week before. (To be a lead newsmaker, someone must be featured in at least 50% of a story.) 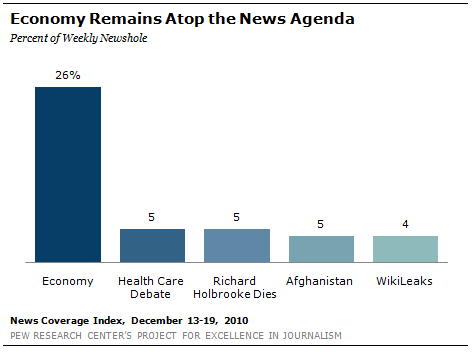 However, Obama remained the chief protagonist of the economic story last week, appearing as lead newsmaker in 15% of all economy stories, making him the No. 1 newsmaker by far. The second most prominent figure in the news last week was Julian Assange, the leader of the Wikileaks organization, who faces criminal charges in Sweden related to alleged sexual coercion of two separate women. 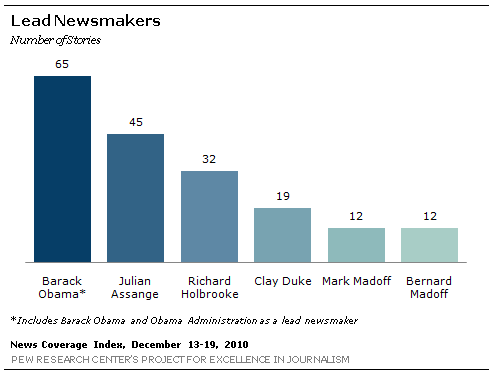 He was the lead newsmaker in 4% of all stories last week. The late diplomat Richard Holbrooke was next, appearing prominently in 3% of all stories last week. Many of the obituaries reflected on the mixed picture of Holbrooke—a supremely talented individual who nevertheless was sometimes hamstrung by his own rough edges. The No. 4 lead newsmaker last week was Clay Duke, the subject of a harrowing school board meeting standoff in Panama City, Florida. Duke, a “troubled, broke ex-con with bipolar disorder” in the words of the Associated Press, held up the school board on December 14. He fired at, but missed, the board members, before killing himself. The incident was caught on camera by local TV stations, there to report on the board meeting. Graphic video of the incident was posted on the Internet and, in some cases, broadcast on national television. Duke was the subject of 2% of stories last week. Tied for No. 5 were two members of the Madoff family, Bernard and his son Mark, in another tragic case where suicide made headlines. The younger Madoff was found hanging in his Manhattan apartment on the second anniversary of his father’s arrest for masterminding what is thought to be the largest Ponzi scheme in U.S. history.